Whether you are renovating, clearing out or helping a loved one in Kirrawee from time to time everyone will need a skip bin. 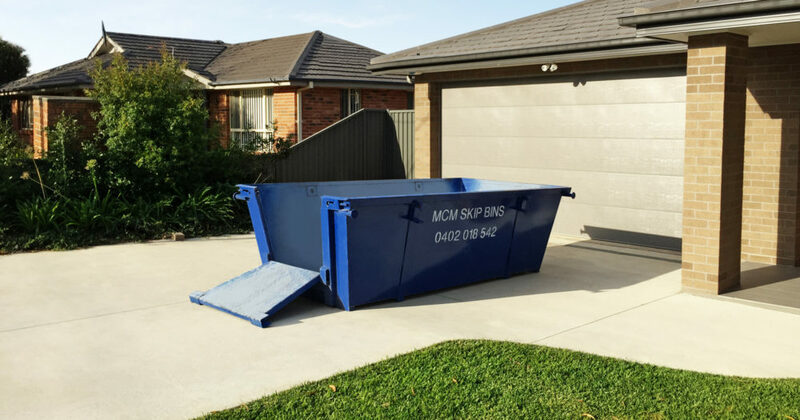 MCM Skip bins provide households and businesses in Kirrawee with easy solutions to get rid of your rubbish at a great price. You can rely on our advice to help with sizing and placement of your Kirrawee skip bin hire. We have friendly and professional drivers for on time delivery who can answer any questions including what can and cannot be placed in the bin. Almost all household and building waste can be taken away. Our FAQ page goes through in detail the rare items that we cannot take or attract an extra charge. Breaking up old furniture into flatter or smaller pieces and stacking them neatly in the bin creates more room allowing you to fit as much as you can into your bin. Taking the time to stack tiles, timber and other building waste is recommended to maximise your bin. Our bins are very popular in the buzzing suburb of Kirrawee. Tucked away in Sydney’s south, this beautiful leafy suburb backs onto the National Park. Its residents enjoy bush tracks, sporting fields and even a lovely dog park. Homeowners are consistently embarking on improving homes, redeveloping or knockdown rebuild. This coupled with a train station and great schools like Kirrawee Public School and Kirrawee High School make Kirrawee a desirable place for families to live. On the other side of the train line MCM Skip Bins also hire skip bins to factories and commercial businesses located in the commercial hub of Kirrawee. It is common that from time to time business need to do a clean up, office fit out or have a large job on creating extra waste you need to get rid of efficiently and as cheap as possible. Kirrawee has long been host to the car industry. The many glamorous showrooms and service centres served as a starting point drawing in many other businesses over the years that are now well established and successful businesses, hence drawing in larger clientele such as hardware and fast food chains. There are so many local people employed and small businesses operating in the hive that is Kirrawee. Kirrawee is finding its place as the next big hub of the Sutherland Shire. A balance of business, restaurants and hotels, the large apartment development at the Brick Pit and over the quieter side, village style residential streets make Kirrawee the place to be.